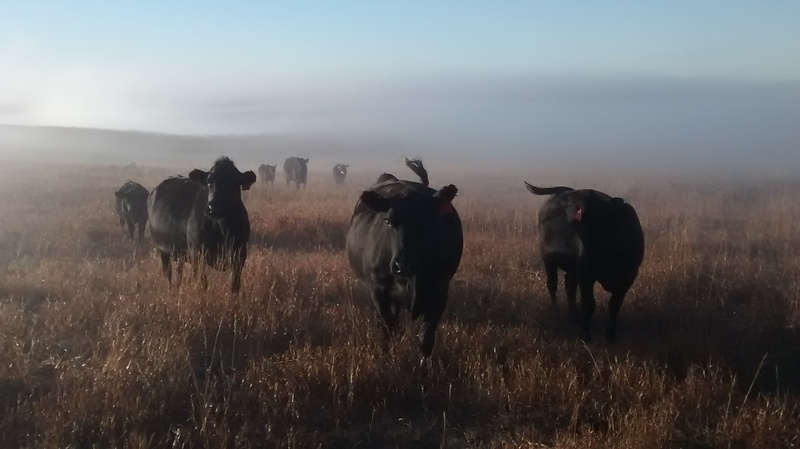 The cattle at Ryun Livestock are a growing operation for us. We are working to build a commercial herd of Angus and Angus-cross females that are good fleshing, good mommas, level headed, and efficient. We started this adventure in 2010 with our first calf crop arriving in 2011. In late 2012 we added a few more mother cows and we now hope to build our own herd from these foundation females by keeping replacement heifers. As with our horse operation, we strive to 'breed to the best' and improve what we have. We currently have an own son of SAV Bismark 5682, "Bully", and an own son of Sitz Upward 307R, "JD", as our herd bulls. In 2015 we incoorporated some AI genetics, and have been very pleased with our 2016 calves - so much so, that we did a repeat for our 2017 calf crop. While you won't become as familiar with our cattle as our horses (sorry, I'm not posting pictures and information on each of our mother cows and their calves! ), you can rest assured that the quality carries in to our cattle. The beef we raise ends up on our table as well as the possibility of your table so we take great care in keeping our animals healthy, happy and well cared for to the best of our ability. There has been more than one calf brought in to spend a day in the house to warm up, more than one cow that we've fretted over for various reasons. The cattle are part of our livelihood as well as an important part of our daily life that we care a lot about. Jacob and Kristine have been completing some programs and courses through the Beef Quality Assurance recently to provide confidence to our buyers - both of our calves and the end product in the grocery store. Enjoy meeting some of the members of our herd.